FOURMI Skates are returning to Chicago for GlobalShop 2018! FOURMI Skates are returning to Chicago for GlobalShop on March 27-29, 2018. GlobalShop is one of the world's largest annual event for retail design and shopper marketing. It's the only show where you can find the largest, most comprehensive array of store fixture companies and more in-store solutions than any live event in the nation. The GlobalShop show floor in conveniently divided into five sections of the retail design industry—Store Fixturing Show, Visual Merchandising Show, Store Design and Operations, Digital Store and At-Retail Marketplace. Our shelf movers will be located in the Store Fixture Show. 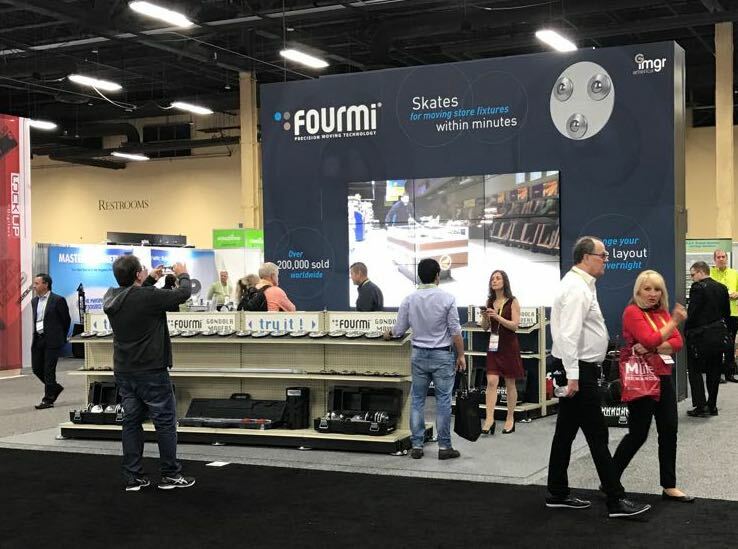 Come and see us at booth #4324 at the Store Fixturing Show and try FOURMI skates on a gondola row. We look forward to seeing you there. For more pictures please visit FOURMI at GlobalShop 2017. FOURMI Shelf Movers: The must have tool for remodeling your stores. Moving gondola shelving and other store fixtures has never been so easy! FOURMI is a revolutionary retail solution for moving store fixtures within minutes. Come and see us in Chicago for Globalshop 2018 - Booth #4324.